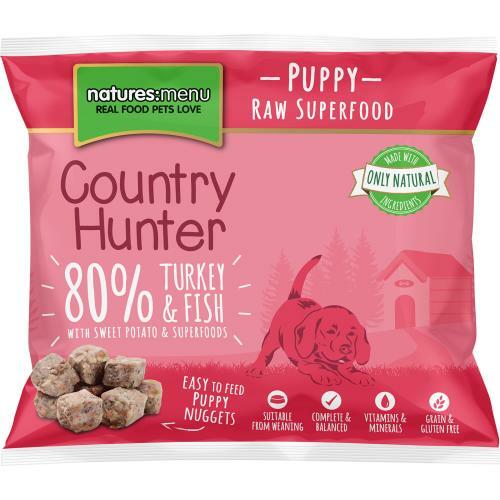 Natures Menu Country Hunter Puppy with Turkey and White Fish nutritionally completed with sweet potato, swede and spinach is a grain free raw recipe perfect for puppies from weaning age. 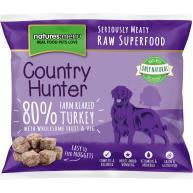 Made with human grade cuts of meat and free of meat meals and meat derivatives, the nuggets are the perfect way to start your growing dog on a raw diet. Just count the nuggets out, thaw, and serve! 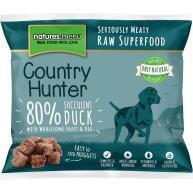 Natures Menu frozen raw pet food will be delivered by our trusted supply partner separately to any other items in your order in order to ensure your food stays frozen all the way to your door. 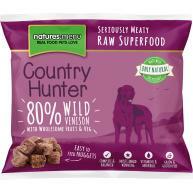 You will receive a separate email from Natures Menu confirming delivery details within 24 hours (Monday to Friday) of placing your order. Thinking of switching to Raw but not sure how? 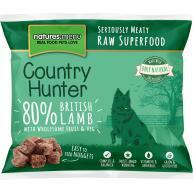 Read Natures Menu’s Transitioning guide here. Vitamin A 1,000iu, Vitamin D 100iu,Vitamin E 14mg.Zinc Sulphate Monohydrate50.1mg; Ferrous Sulphate Monohydrate20mg; Cupric Sulphate Pentahydrate 7.2mg;Calcium Iodate Anhydrous 0.4mg; SelenisedYeast Inactivated 8.6 mg/kg.